WOKING’S first game of 2016 saw them step into an exciting new world as they completed their first ever league double over neighbours Aldershot Town. Kingfield’s largest crowd of the season, packed with fans from both sides of the tracks, saw first-half strikes from Cards duo Joe Quigley and John Goddard set the hosts on their way to their landmark win. Despite the January dank nobody was leaving this end-to-end clash early, especially when Shots sub Rhys Browne set up a grandstand finish with a goal 16 minutes from time. This first derby day of the New Year fell on National Science Fiction Day (apparently there is such a thing). And Cards fans’ dreams of a future in which their side hold the bragging rights after a maiden league double over their old foes became reality as Woking held on to their lead for dear life. For ecstatic Woking manager Garry Hill this local thriller, although perhaps lacking any Oscar-winning performances from any one individual, was a result of essential supporting roles from his entire cast. From goal scoring duo Quigley and Goddard to the defensive shift put in by the likes of the ever-improving Joey Jones in defence and his captain Mark Ricketts leading the charge, Hill’s full deck of Cards proved too strong for their former Football League visitors. 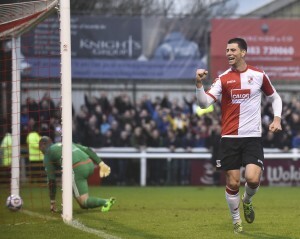 Woking consolidated their grip on seventh place in the Vanarama National League table after adding a sixth undefeated league game to their hot streak – just three points now separate the Cards from Macclesfield Town who occupy the final play-off berth in fifth place. A maximum six-point haul from their double-header with the Shots leaves Cards fans looking up the standings rather than over their shoulder, as many had begun to during a run of eight defeats from 12 games in a testing autumn for Hill’s men. The delirious majority of the bumper New Year Kingfield crowd greeted the final blast of the referee’s whistle with a release of jubilation and relief; Woking having held firm against a late Aldershot onslaught after Browne’s goal, and having shed that unwanted ‘no league double’ tag. Home fans certainly took pleasure in reminding their Shots counterparts, as they sloped back to Hampshire, that a relegation fight most likely awaits their side over the final four months of the season as they slipped down to 17th place. Also needing to hold firm was the Kingfield groundsman Colin Galliford’s unseasonably green playing surface. Despite a few puddles here and there, the damp pitch made it through the afternoon – unlike four other National League games which fell foul to Storm Frank – as, thankfully, persistent drizzle rather than a downpour fell during the 90 minutes. The buzz of excitement at kick-off was not quite matched by a tentative opening quarter of an hour, in which both sides made cautious forays into the opposing half. Up for a Goddard corner, Jones headed on target while Shots forward pair Charlie Walker and Daniel Carr sent long-range efforts just wide of the mark as the game warmed up. But it was to be Bournemouth loan youngster Quigley who would notch the most vital of his three Cards goal to date after 25 minutes. A jinking run from Goddard left opposing full-back Cheye Alexander for dust before the playmaker picked out Quigley with a cut back to the penalty spot, which the tall frontman coolly dispatched low past goalkeeper Phil Smith. Just 10 minutes later and Quigley and the Kingfield Road End were cut short in further celebrations when an offside flag ruled out a finish from Bruno Andrade’s centre. A superb reflex stop from Jake Cole kept out a bullet Walker header in the 38th minute, and the save was to prove even more crucial as Goddard made it 2-0 in first-half stoppage time. What had seemed a regulation ball over the top by Jones caused confusion in the Town back line, with Holman standing in an offside position but not deemed active by the linesman. And so, with Shots’ defenders Omar Beckles and Joe Oastler appealing in vain, Goddard ran unopposed towards Smith’s goal before calmly side-footing into the bottom right-hand corner – cue the obligatory knee-slide celebration. It was the perfect time to grab a second as the half-time whistle sounded moments later; the interval pie and pint tasting sweeter than ever for home supporters. So often the scourge of the Shots in recent years, Giuseppe Sole entered the fray for the injured Holman at for the start of the second half – Woking boss Hill confirming post-match it was to be loan striker Holman’s last action for the club. A January transfer window move to a Football League side – Hartlepool United and Cambridge United rumoured to be among his suitors – awaits Cards’ 17-goal top scorer. Meanwhile, under-fire Aldershot boss Barry Smith called livewire winger Browne from the bench; Hill replying by sending on full-back Chris Arthur to bolster the defensive wall. With nothing to lose as the game reached the final stages, Smith threw men forward and grabbed a goal back when youngster Browne finished off a Jim Stevenson rebound from 10 yards out with 16 minutes remaining. With the pressure levels ratcheted up by the goal, the derby day handbags at dawn were out momentarily on the terraces and onfield. Shots captain Sean McGinty and Cards’ Jake Caprice swapped football for a spot of Greco-Roman Wrestling – both men being cautioned for their troubles. Woking were forced to defend for their lives as Shots reined down an aerial bombardment in the closing stages – sub Dan Walker seeing a deflected effort go a whisker wide, while tall trio Carr, Beckles and McGinty looked to get on to the end of numerous crosses into the box. With nerves now shredded all round, Woking survived one last scare as (Charlie) Walker rattled the angle of post and crossbar from eight yards after a McGinty knock down. Four minutes of stoppage time felt like four hours for home fans, who held their breath as their men blocked, headed and scrambled their way to the finishing line for an historic victory.